With the launch of Showbie’s gradebook this past August, some teachers may not have noticed that Showbie included the ability to use emojis. For many, emojis are just another trend that won’t last longer than Justin Bieber’s latest haircut. 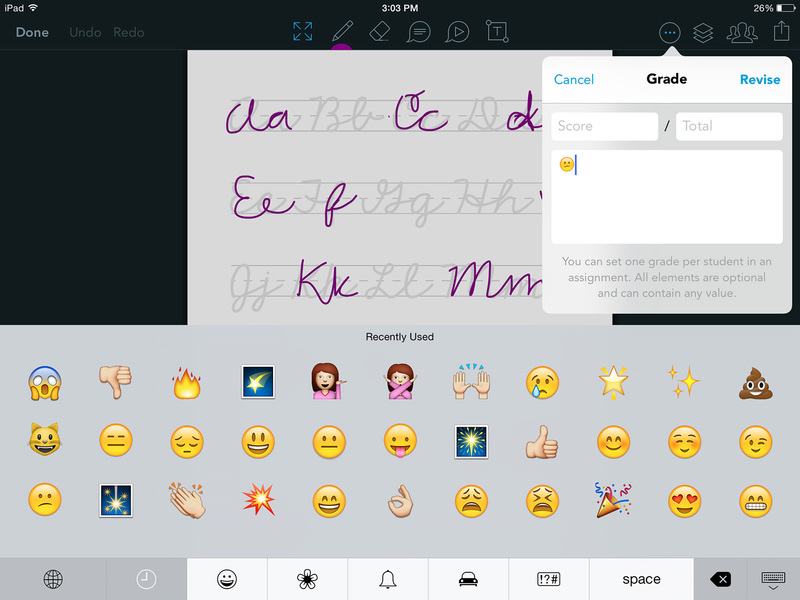 For teachers using Showbie Pro, however, emojis can be a quick, efficient and fun way to provide feedback. April Sauline, IT/ICT Coordinator in Las Vegas, NV (and Showbie Champion) recently spoke to Showbie about promoting emojis as an effective way to quickly grade in the classroom. How many times can you say ‘great job’ before it’s meaningless to students? Emojis save more than just time for teachers. It’s likely that students use emojis even more than teachers, so they’re easier to understand and leave a more lasting impression than written feedback. As their name suggests, some emojis are excellent at conveying an array of feelings in a single image. “I always use the ???? emoji when kids send me work that I think is unacceptable. It quickly connects using an emotion that you almost can’t put into words,” April explains. In terms of how other teachers are using emojis to quick grade, April says her colleagues all have a different style, but they generally stick with the emojis that are easier to identify, such as the face and hand emojis. One teacher solely uses the ???? emoji to grade, and when it’s absent from their work students know they haven’t done a good job. With dozens to choose from, there are definitely emojis teachers shy away from. For example, though many teachers would love an excuse to use ???? for poor performances — “It’s still smiling!” April jokes — it would take some courage to use. And even though some of the more humanoid emojis can get lost in translation, ‘celebratory’ emojis such as ???? and ???? can be just as effective as face and hand gestures. Which Showbie Plan is Right For You?